James Patterson, if you don’t know already, is the author of the Women’s Murder Club series, Alex Cross series, Middle School, the Worst Years of My Life series, Witch and Wizard series, Michael Bennet series, Daniel X series, Don’t Blink, Kill Me If You Can, and many more. I know a lot of James Patterson fans, and I also enjoy some of his kid or young adult books. The Maximum Ride series is about a girl named Maximum “Max” Ride. She is basically the protagonist of the story and the books are from her point of view. She is accompanied with her “Flock” named Fang, Iggy, Gazzy, Nudge, and Angel. You might be wondering about the whole “Flock” thing. They are bird kids. They were science experiments who escaped from the lab they call the ‘School’, hence the name School’s Out-Forever. (Yes, I know. I’ve said that a lot!) In the different books, the kids start developing different powers. Throughout the series, you hear of their adventures running away from the Erasers, half- human and half-wolf beings created by scientists in the School. It might sound pretty weird, but give it a chance. You might really like it! 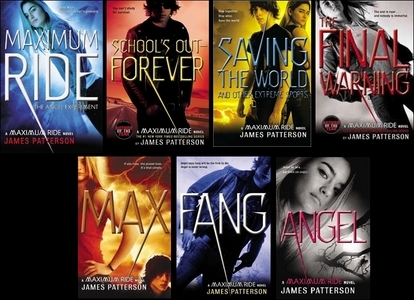 The Angel Experiment is the first book in the Maximum Ride series by James Patterson. It is about a girl named Maximum “Max” Ride and the rest of her flock: Fang, Iggy, Nudge, and the only blood related ones, Gazzy and Angel. In a nutshell, all of them are mutated bird kids that escaped from the School together. The School is like a place with a bunch of scientists that do horrible things to the “patients” there. But when the Erasers (part man, part wolf creatures) capture sweet little Angel, the flock must take a terrifying and dangerous journey to go back to the school to save her! All of the Maximum Ride books are amazing. I especially like them because of the strong female protagonist named Max. It seems that this situation of the girl being the strong character has made many great stories. For example: The Hunger Games by Suzanne Collins, The Girl with the Dragons Tattoo by Steig Larsson, Jane Eyre by Charlotte Bronte and even the Disney movie, Brave. Mostly what I love about this book and the whole series is the mix of the characters. All of the characters of the story are unique and different and unlike any other in any other book. You also get to see changes of them throughout the books.